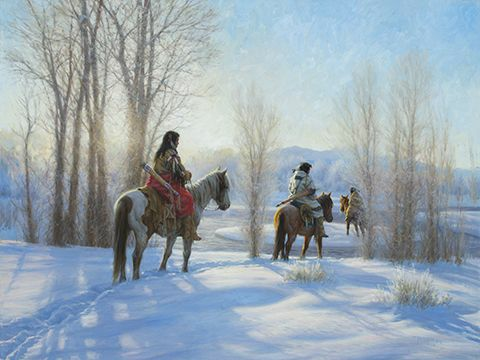 Home | New Releases | Robert Duncan Hand Signed and Numbered Limited Edition Canvas Giclee:"Cold Journey"
Robert Duncan Hand Signed and Numbered Limited Edition Canvas Giclee:"Cold Journey"
Edition: Limited Edition Canvas Giclee printed directly on archival canvas with archival inks. Each image is signed, numbered and inspected by Robert and includes a certificate of authenticity. Limited to 275. About the Artist: Robert Duncan was born in Salt Lake City in 1952 and grew up in a large family of ten children. He spent the summers helping his grandparents on their 10,000 acre cattle ranch in Wyoming. The Green River ran through their land from its source high in the Rocky Mountains. It was surrounded by beautiful open country and he fell in love with the rural lifestyle. He drew constantly from the age of five, and when he was eleven, his grandmother gave him his first set of paints and paid for three oil painting lessons. He studied art at the University of Utah and had worked as a commercial artist before his full-time dedication to the fine art of the American West. Robert has traveled extensively throughout his career to visit museums and study the great artists he admires. His travels have included journeys to Russia, Scandanavia, many trips to Europe, and frequent trips to the East Coast and Canada. Robert was elected into the Cowboy Artists of America at 29 years of age and won two silver medals in their annual exhibition at the Phoenix Art Museum. The Cowboy Artists of America is the most respected organization in Western American Art. After five and half years with the Cowboy Artists, Robert decided to resign in order to put less emphasis on western art and devote more time to painting his family, friends and the beautiful countryside of Midway and the Heber Valley, UT. Duncan has shown his original paintings for over 30 years with Trailside Galleries in Scottsdale, Arizona and Jackson, Wyoming. He has been invited to numerous shows around the country including the Masters of the American West Exhibition at the Autry National Center, The Great American Artists Show in Cincinnati, and numerous others. Robert's print and posters were carried for many years by New York Graphic Society in New York City. Robert and his wife Linda have six children. They, along with a lively assortment of animals, live in the small town of Midway in northern Utah. Home | Fine Art Prints & Limited Editions | Robert Duncan Gallery | Robert Duncan Limited Edition Canvas Giclee Editions | Robert Duncan Hand Signed and Numbered Limited Edition Canvas Giclee:"Cold Journey"
Home | Framed Art | Robert Duncan Gallery | Robert Duncan Limited Edition Canvas Giclee Editions | Robert Duncan Hand Signed and Numbered Limited Edition Canvas Giclee:"Cold Journey"